A Bell Tent is a tried and tested form of instant accommodation. Originally designed in the 19th century the bell tent as we know it today has evolved from the Sibley Tent, named after its inventor Henry Sibley who adapted the American Indian tipi. The original bell tent had no guy ropes and relied on the tension between its central pole and the canvas, stabilised by many pegs around the base. Don't worry Dorset Country Holiday's modern luxury glamping bell tents not only have pegs and guy ropes but the built in waterproof floor sit atop wooden decking to make sure you have a solid floor. Mr Sibley patented his original idea in 1856 and the bell tents were immediately put through their paces and tested by the US defence department. The Bell tent was also adopted by other governments for overseas staff and was even used by the gentlemen of British cavalry in 1855. These key characteristics of rugged and tough canvas providing a spacious home from home are the principles that is further refined in glamping bell tents, just with the addition of rugs, beds, sofas and electricity. 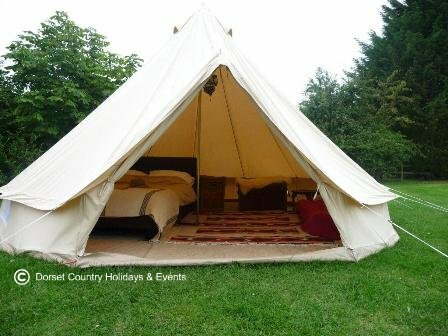 The Bell tent is characteristically different to the Sibley tent because of its walls, raised larger entrance and guy ropes, whilst the smoke hole which is characteristic of the tipi has been removed. Today the airy, roominess and classically beautiful design of the bell tent has had an renascence in the form of the glamping bell tent. Now bell tents provide luxurious holidays with stunning interiors and facilities that their first intrepid users could not even have imagined in their wildest dreams. 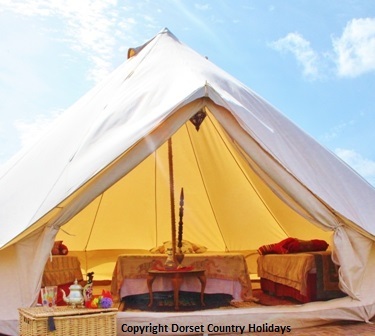 Of course you don't need to worry about erecting your bell tent when you come glamping at Dorset Country Holidays. As our glamping bell tents come complete with electricity, double beds, sofa beds, coolers / fridges and lights the only thing our guest need concern themselves with is whether you want tea or coffee in the morning.